Sevilla Hostel One Centro i Sevilla, Spanien: Reservér nu! Thank you for an awesome stay! 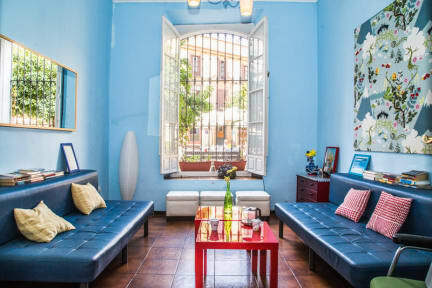 This place i a great base for seeing the rest of Sevilla and the people in the hostel are really helpfull, sweet and nice. 10/10 And a special thanks to Diego, for showing me the city and a awesome stay. He is a champ. This hostel is really cosy and you feel like home. Nice and very kind staff. I Will return next time I’m in Sevilla. Definitely the best hostel I've ever stayed at! The atmosphere is amazing, the staff are so friendly and they're always ready to chat with you. There's lovely free dinner by Chung every night, which is a great way to socialize. Likewise there's free pub crawls every night (I can only recommend joining!!) and cozy areas at the hostel where you can chill. If you're looking for a social, festive and cozy place to stay, I wouldn't go anywhere else than Hostel One Centro ;) I'll for sure be back!